Socialization/Training: Wilder is crate trained and prefers to sleep in his crate at night. He has spent his days while I am at work uncrated and has been a perfect houseguest (hasn’t had one bathroom accident or engaged in any destructive behaviors). 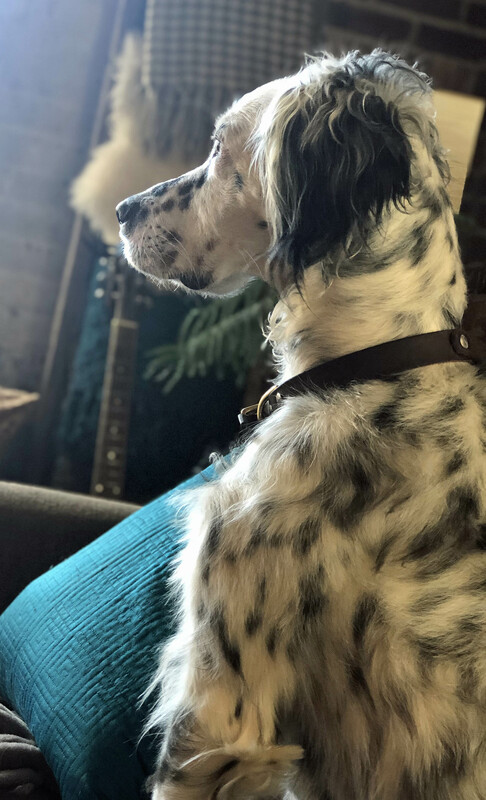 When he arrived into foster, he did not demonstrate any signs of former training; however, in the two weeks we have been together, he has already learned some hand signals (sit, come, wait). He is an astute reader of facial expressions and body language. He wants to please his person and is quick to connect. Good with Children: I have not observed Wilder with children. He is very energetic, so I suspect he would be best in a home with no young children. Good with Dogs: Wilder has no doggie foster siblings, but he gets along great with dogs at the dog park. 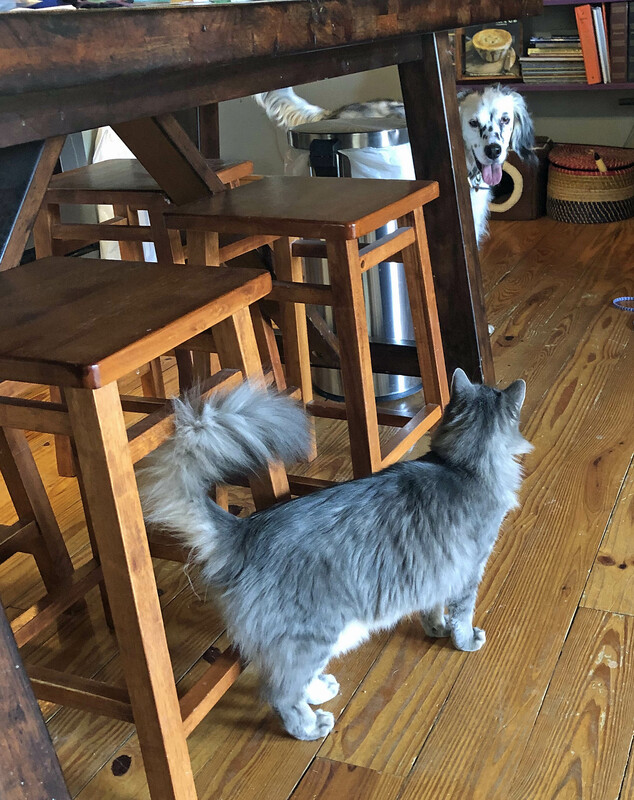 Good with Cats: Wilder gets along great with his kitty foster sibling. House Trained: 100% Wilder hasn’t had one accident while he has been staying with me. He signals any time he needs to go outside by finding me, looking at me, and barking a specific, relatively quiet bark and looking at the door. He’s been amazing. Crate Trained: 100% Completely. He sleeps in his crate every night because he prefers it. He stays out while I am at work because he has proven that he can be trusted and prefers not to be closed up during the day when I am not at home. Activity Level: Outside, Wilder is very very active. 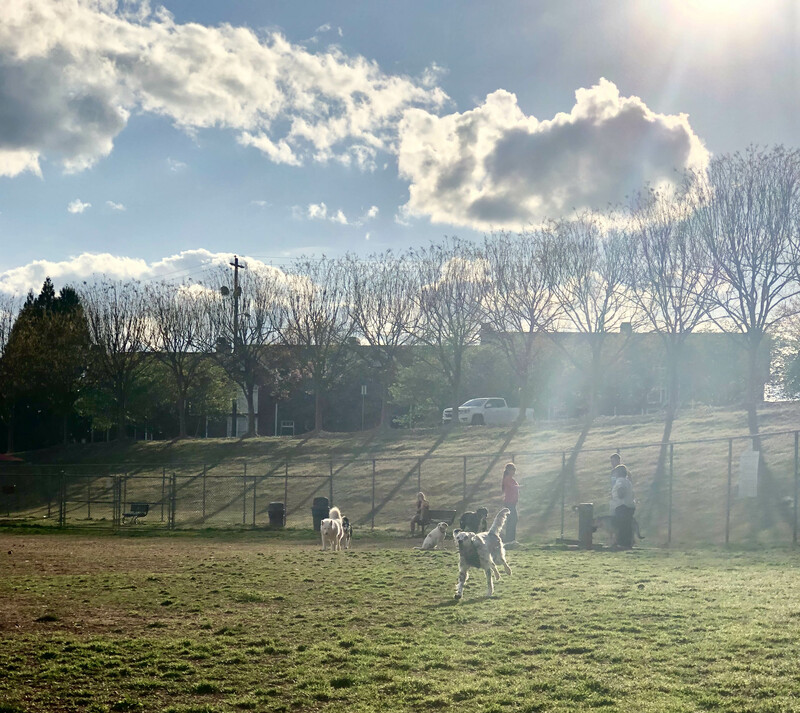 Inside, Wilder can be very fascinated by light and shadows, sometimes single-mindedly focusing on them; prospective adopters must recognize this behavior and redirect it so that it does not become a compulsion. 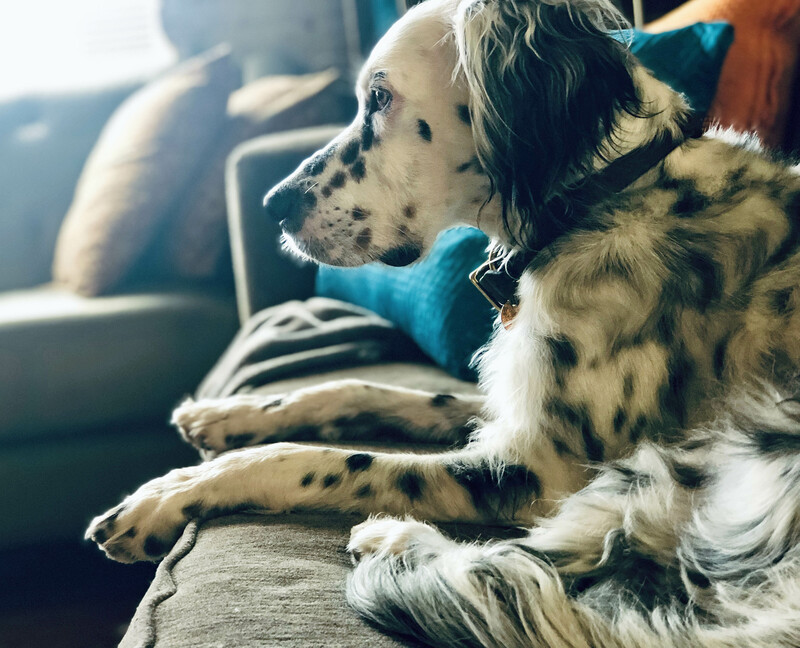 He loves to play fetch inside when he is feeling active (usually lasts about 5-6 throws and retrieves before it turns into tug-of-war which turns into keep-away which turns into hide-my-toys). He also is a classic Couch Setter, loving to catch some zzzzs on the sofa beside his person. walking. Inside, if he gets around a corner before I do, he has learned to turn back and find me. 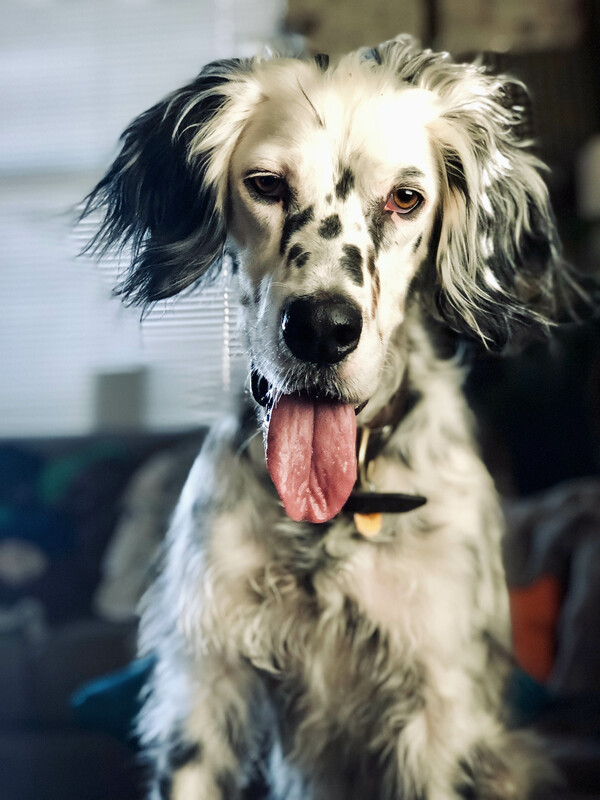 That game has reinforced his innate English Setter tendency to visually check in with his person. 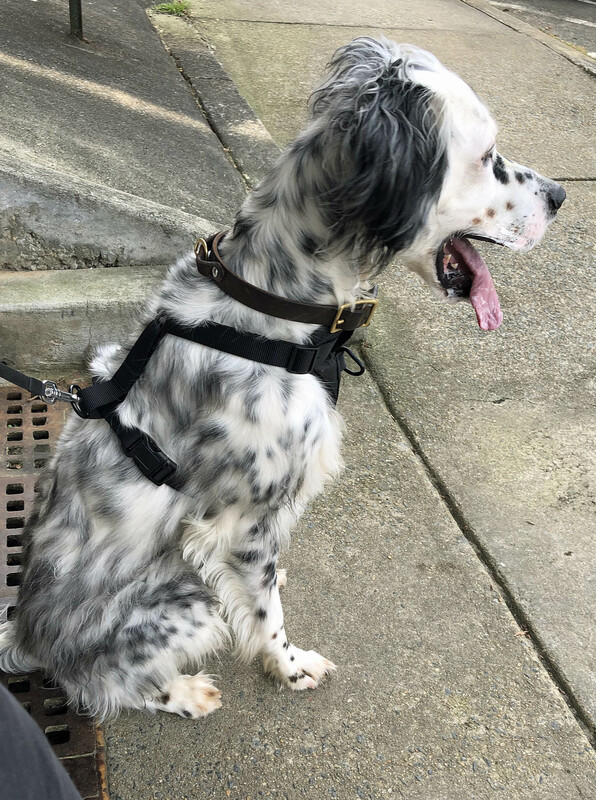 This practice has carried over into his leash time outside as well as his off-leash time in the dog park, reducing his tendency to pull while walking outside. We have just recently started running together on leash, and he seems to love it. 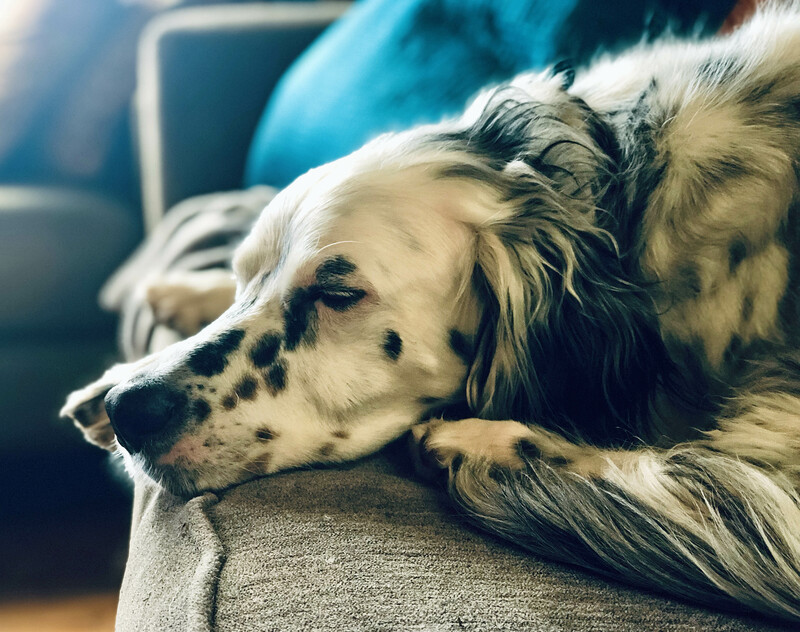 Because he is deaf, Wilder must be accompanied by his person at all times when he is outside, either within a secure high fence (like at a dog park) or on a leash. 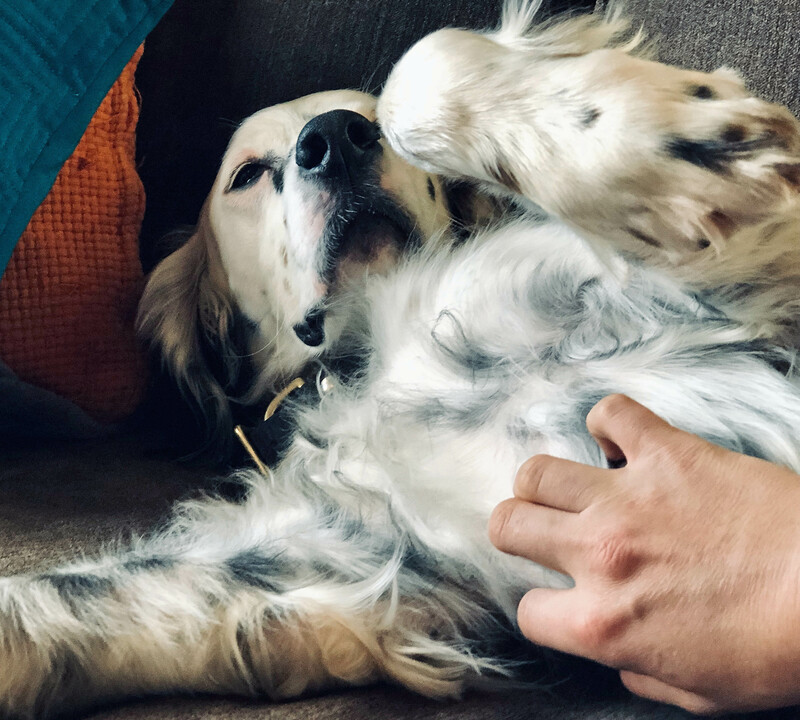 Behavior: Wilder is a cuddler when he is relaxed and inside or when he is anxious; when he is uncertain, physical touch from his person reassures him. When we are inside, he is very, very attentive to his person. 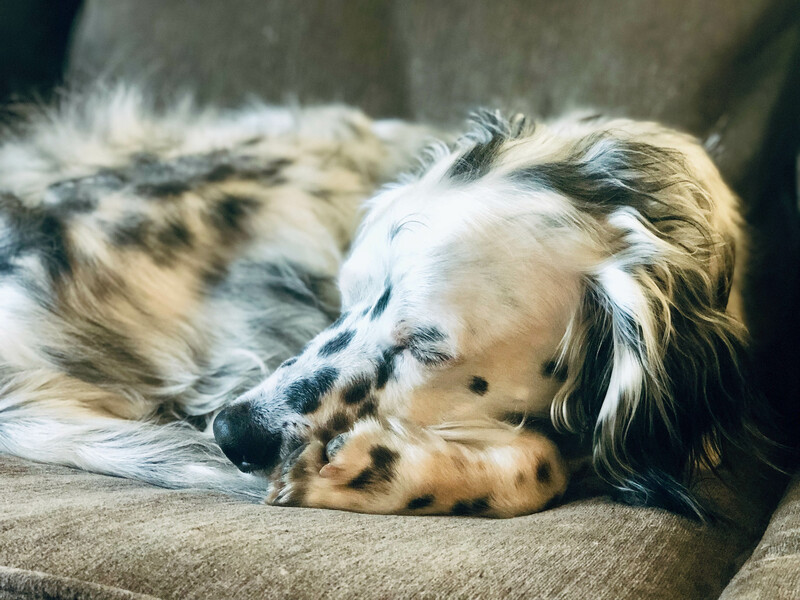 When we are outside, he is highly independent and focused on the outside things that English Setters have been bred to be focused on: smells and sights. He does visually check back in with me when we are outside, but in that setting, he is highly highly independent. Medical History: Wilder is reported to be congenitally deaf. Though I have not had this diagnosis confirmed by a vet, I have no reason to doubt it. He has been on allergy meds (Avoquel) to offset the spring pollen explosion and some skin irritation that had developed in response. Foster Comments: Wilder is the sweetest sweet boy. His transition into his forever home will likely be a little rocky for the first day or so, as such monumental change seems to turn him more fully toward himself rather than outward toward his new people; however, he is very quick to attach to his person or people and will relax and blossom very quickly as he forms new habits and reinforces those he already knows with them. 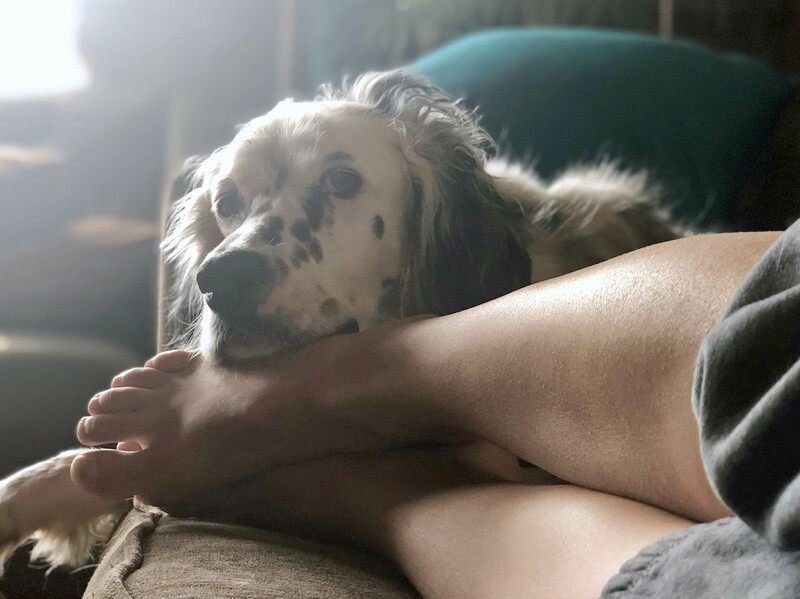 This will happen most quickly in a home where his person or people can be around more than they aren’t, as he is most comfortable, independent, calm, focused and attentive (in a healthy way), and responsive when I am at home for long stretches of time (weekends, spring break, long weekends, etc). He is a joy and has truly been a delightful houseguest. 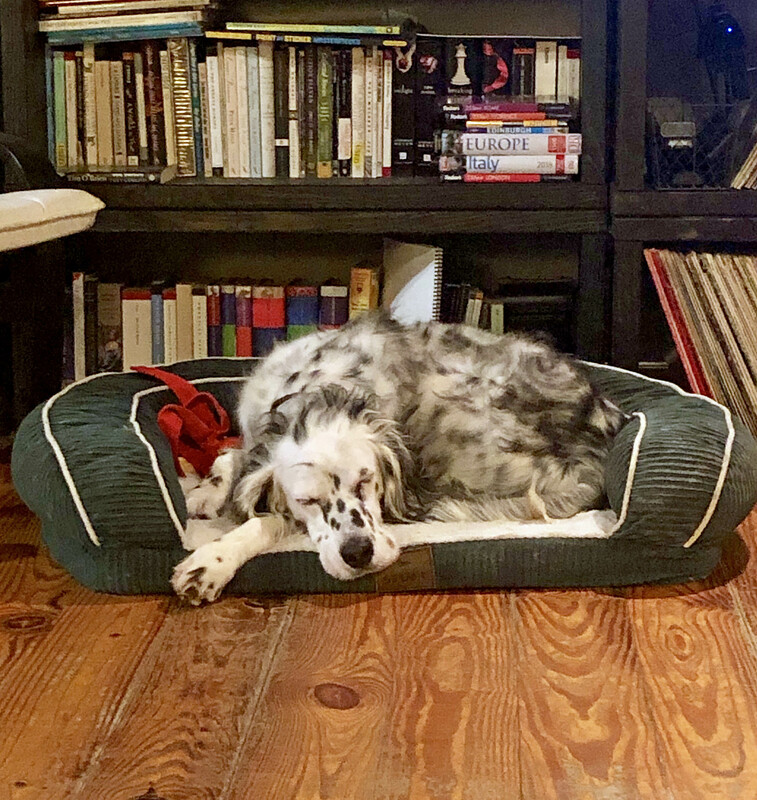 If he didn’t look so much like my recently deceased English Setter, I’d be a foster fail for sure. His new family will be lucky indeed, rewarded for supporting his continued growth and learning, entertained by his silliness, and loved and comforted by his love of his people.